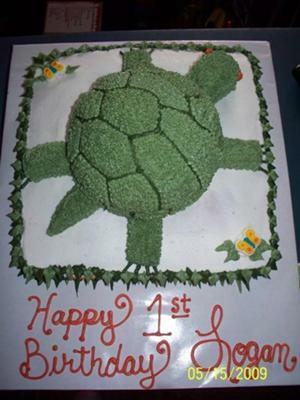 For this turtle cake, I made a 12" square cake. I used the sports ball pan set and made on half of the ball and the rest of the mix I used and made cupcakes. I placed square cake on cake board. Then put a layer of icing on top. Then I added the half ball cake. I used the cupcakes and trimmed them to make a tail, legs and head. I have several turtle shells lying around so I used them for the pattern on the cake. I did the outline in a darker shade of dull green then filled in with the lighter shade in stars. I used 2 orange dots for eyes. I added a few pre-made candy decorations, butterflies and caterpillars and snails. I wrote HAPPY 1ST BIRTHDAY LOGAN on the cake board. I used the leaf tip and did leaves all around the top and bottom for border.